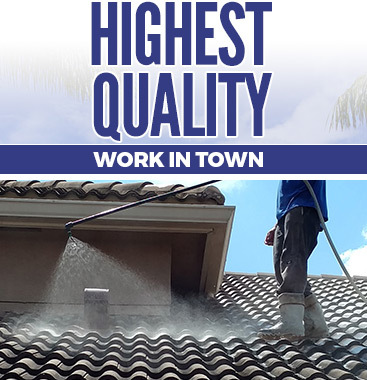 Palm Beach Pressure Cleaning specializes in roof cleaning and preventive maintenance. 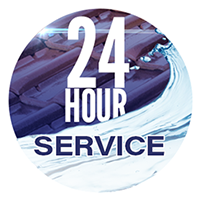 Our roof cleaning procedures have been derived from roof material manufacturers throughout the world. Our system is the only one proven not to void your manufacturer’s warranty. Roofing material on your structures are made to protect you from the rain and wind. These materials are not made to withstand thousands of pounds of pressure and water traveling at hundreds of miles an hour blasting the surface as with a typical pressure washing service. Our procedure is a non-invasive cleaning with minimal exposure to your roof. We have further developed upon the original recommendations from the manufacturer to boost the longevity of the cleaning. Our roof cleaning detergent is one of a kind and will outlast all others. Typical cleanings should last two years, whereas preventative maintenance programs should be on a yearly basis. As a property owner, it is beneficial to have your roof properly maintained to be able to enjoy the full life of your roof without having to prematurely replace it due to improper maintenance. In Florida, our biggest culprit for roof staining is mold. The organism feeds on the material in your roof and speeds the deterioration of it. This mold has also been proven to cause allergies and respiratory issues. Once these mold colonies are on your roof and thriving, they make their way down the walls, onto your driveway, patios, balconies, and landscape to further propagate. Preventive maintenance stops this vicious cycle. Even though you can’t see the stains, that doesn’t mean that the microscopic organism isn’t colonizing. Preventative maintenance procedures are typically comprised of an algaecide detergent applied to coat the area, keeping it clean for another season. Contact Palm Beach Pressure Cleaning today to discuss your roof cleaning needs or to schedule an appointment.